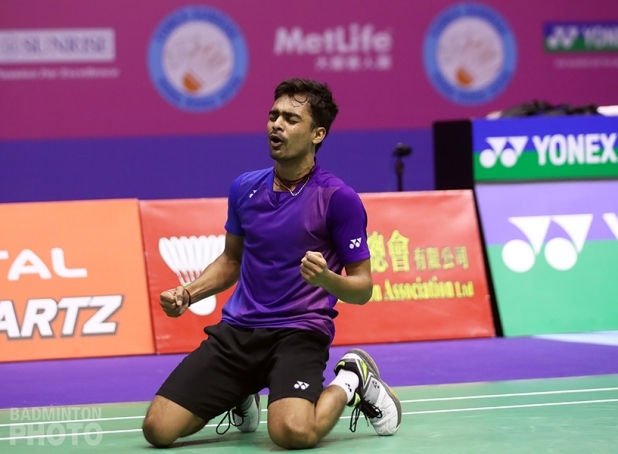 India’s Sameer Verma stunned world #3 Jan Jorgensen and he and home favourite Ng Ka Long will decide who takes his first Superseries title in Hong Kong on Sunday. It’s not the first time the name ‘Verma’ has shown up on the back of a finalist’s jersey in a major badminton tournament in 2016. Sameer’s brother Sourabh already has one Grand Prix title and one Grand Prix Gold runner-up result (the same week Sameer reached his first major semi-final). In fact, there was even another Verma in the Russian Open final, although Siril is not from the same family. This is, however, the first Superseries final appearance for young Sameer Verma (pictured). The 22-year-old made a name for himself as a junior when he was runner-up at the 2011 Asian Juniors and won silver at the Commonwealth Youth Games the same year. He had to wait until this month to make his mark on the senior stage but has he ever! Sameer saved no fewer than four game points to send off last week’s China Open winner and world #3 Jan Jorgensen 24-22 in the second game. The Indian had great success keeping Jorgensen off-balance with punch clears deep to the Dane’s forehand corner. Together with some fantastic net play and crisp smashes, he had just what it took to beat the man who had been playing some of the best badminton of his career for the past two weeks. In fact, the men’s singles title will be not only be the fifth career Superseries first but for the fourth time in the past five Superseries events, it will also go to a first-time finalist. Hong Kong’s Ng Ka Long (pictured) had his fantastic run stopped in the semi-finals last year when he couldn’t follow up his wins over Lin Dan and Chou Tien Chen with another against Lee Chong Wei. This year, he has made it all the way to Sunday without playing a seeded player – Verma himself had to beat only one – and will carry the hopes of the home fans. He is the first Hong Kong representative to play in a final here since Wang Chen won the women’s singles title in 2008 and he will attempt to become the first Hong Kong-born player ever to win the Hong Kong Open. When four-time winner Lee Chong Wei withdrew from the Hong Kong Open on the eve of the tournament, he placed himself in some danger of not qualifying for the Superseries Finals in Dubai, a tournament where he is also a four-time champion. That danger seemed remote back on Monday but it became significantly more grave as the week went on and it looked as if either Wong Wing Ki, or Hu Yun, or both, might make it to the final. 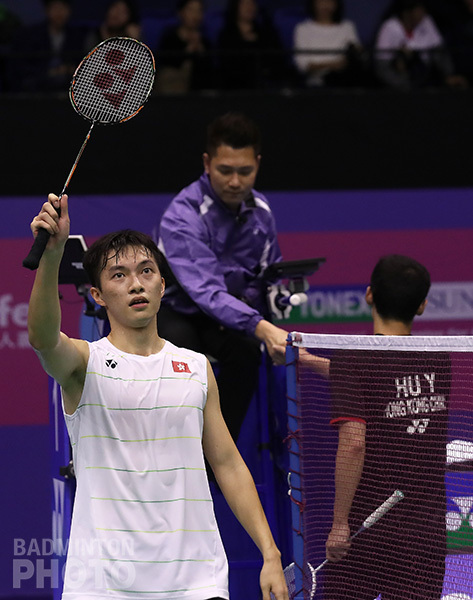 Hu Yun was the last player with a chance of ousting Lee Chong Wei for the 8th spot in Dubai but his hopes ended with his semi-final loss to Ng Ka Long. Hu will be the first alternate, however, and reaching the semis in Hong Kong did ensure that he would get the nod ahead of Wong, should any of the top 8 be forced to refuse their invitation to the season-ender. Boe/Mogensen into the final, and the Finals! In contrast to Hu Yun, Denmark’s Mathias Boe / Carsten Mogensen (pictured right) did change their stars with regard to their Dubai ticket. 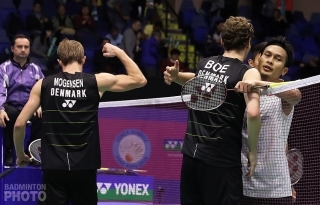 With the first-round loss of their compatriots Astrup/Rasmussen, Boe/Mogensen were still faced with having to reach their third straight Superseries final in order to qualify for the Superseries Finals. The Danes had to work much harder in their final week than fellow three-time Superseries Finals champion Lee Chong Wei (a four-time winner, in fact). Apart from wild card qualifiers Chen Long and Fu/Zhang, Lee and Boe/Mogensen are the only ones to qualify for Dubai on the strength of their performances in only six Superseries tournaments. 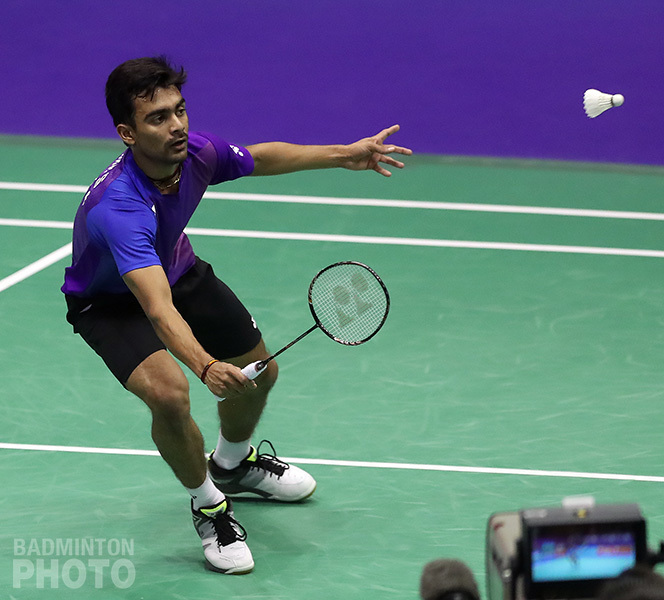 After tough encounters earlier in the week, the 2015 Hong Kong Open runners-up made quick of the new pairing of Rian Agung Saputro and reigning World Champion Mohammad Ahsan. Their opponents will be Takeshi Kamura / Keigo Sonoda (pictured left). 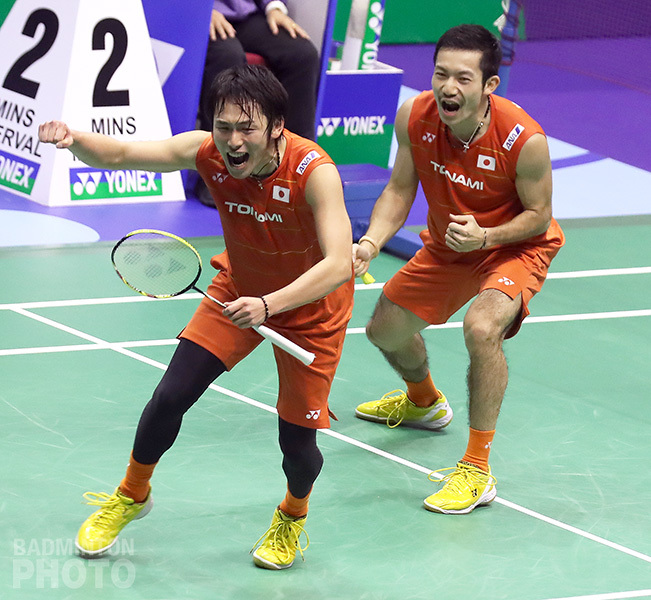 The Japanese pair, who reached the top 10 in the world for the first time this week, will be looking to make good on their second appearance in a Superseries final, after they were beaten at this year’s Singapore Open. If they can manage it, they will go to Dubai having finished at the top of the 2016 Superseries table. In addition to Boe/Mogensen, there are three others who will repeat as finalists from last week. In women’s singles, Pusarla Venkata Sindhu fought off a gutsy challenge from local favourite Cheung Ngan Yi to maintain a shot at a second consecutive Superseries title. In fact, her win a day earlier, along with the loss by her compatriot Saina Nehwal, had confirmed her first ever participation in the Superseries Finals. Before she heads west to the U.A.E. in December, though, Sindhu will first be hoping to add to her trophy case over here in the east. She will have another tough opponent in the final, though. This week, it will be the 2014 champion Tai Tzu Ying (pictured right) of Chinese Taipei. Tai is on a run of her own, in a way, as she beat Olympic gold medallist Carolina Marin for the second straight week. 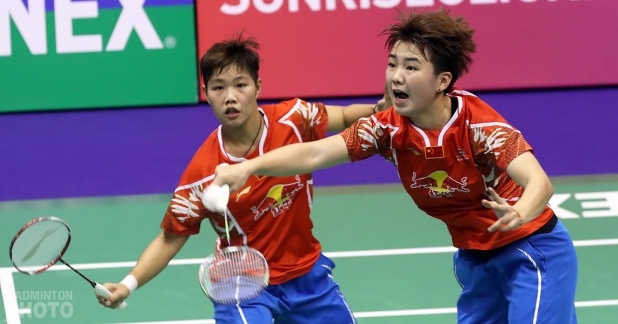 In the women’s doubles, Li Yinhui will get one more chance to take a Superseries title as a teenager, as next year’s All England final – should she be so lucky – will fall on the day after she turns twenty. On Saturday, Li and Huang Dongping (pictured bottom) beat their compatriots Chen Qingchen and Jia Yifan 22-20 in their second game to reach the final. It is the seventh straight Superseries event with a teenaged finalist and both Li and Huang will be hoping to turn it into a title. On Sunday, their opponents will be Kamilla Rytter Juhl / Christinna Pedersen of Denmark, whom they beat in last week’s China Open semi-final. The Danes won rather easily against Yu Xiaohan and 2013 winner Bao Yixin. The mixed doubles will be an all-Indonesian final. China Open winners and Olympic gold medallists Tontowi Ahmad / Liliyana Natsir finally ended the fairy-tale run by Chinese Taipei Masters winners Tang Chun Man and Tse Ying Suet (pictured left). The Hong Kong pair had a great start to the first game and reached game point first but could not close it out and were dominated in the second. All England winners Praveen Jordan / Debby Susanto got some payback from Choi Sol Gyu and Chae Yoo Jung, coming back from a game down to beat the Koreans 21-18 in both the second and third games.